1. Instrumentation: vocal sextet or mixed choir (SMezATBarB). a. Female voices only (SMezASMezA). b. Male voices only (TBarBTBarB). 2. Preparation: prepared and unprepared. Period of creation 2016-08-06 to 2016-10-25. Commission / occasion Commissioned by the vocal ensemble <belcanto> – Dietburg Spohr (Ger), funded by the Ernst von Siemens Music Foundation (Ger) and by Norsk kulturråd / Norsk kulturfond (The Arts Council Norway / Norwegian Cultural Fund) (Nor). 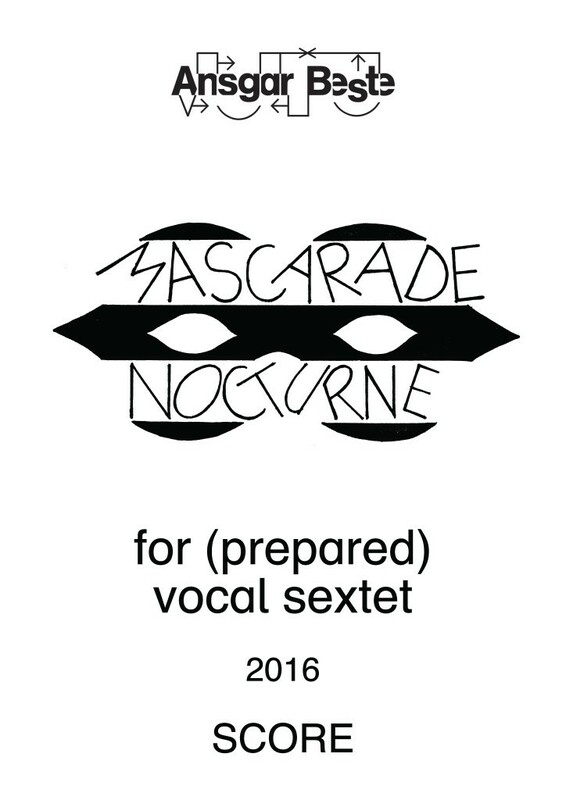 The work Mascarade Nocturne was first of all inspired by a courtly masquerade resp. by a traditional masked ball in former centuries. Old and more recent dance rhythms of popular music are generated by vocal noises and elements of vocal percussion, i.e. by the imitation of the drum-set through human vocal articulation. The dance rhythms appear in diverse variations: treatments like augmentation/diminution, permutation and modulation result in a rhythmic tex­ture with varying degrees of density, partly through polyphonic superpositions. This rhythmic framework gives rise to a musical form consisting of three more animated and two contrasting calmer sections (A B A’ C A”). In these calmer sections B/C the masquerade is surrounded by a nocturnal atmosphere – quiet, meditative, lyrical and cantabile in character, suggesting the image of night, moonlight and dreaming. Three vocalists are making use of their singing voices, repetitively quoting shorter me­lodic excerpts from the ‘Dark’ Ages: from the medieval opus magnum Ordo Virtutum (≈ 1151) by Hildegard of Bingen (1098-1179). The excerpts used and fragmented in the through-composed sections (bars 26-41 / 43-57 and 73-88 / 90-104) could stand for the inner fears of the dark: ‘succurrite mihi’ (come and support me) from Anima Illa (no. 11), ‘fugo […] Diaboli’ (I’m fleeing from the Devil) from Verecundia (no. 47) as well as ‘curre’ (run now!) from Humilitas ad Victoriam (no. 75). By contrast, the excerpts provided as a basis for two improvisational sections (bars 42 and 89) could symbolize the light at the end of the tunnel: ‘speculum vitae’ (mirror of life) and ‘fontem salientem’ (leaping fountain) from Fides (no. 33) as well as ‘O victoria’ (Oh Victory) from Humilitas ad Victoriam (no. 75). – Commission support from the Ernst von Siemens Music Foundation (Ger) (2015-05).